candy sprinkles, hagel, funfetti, chocolate pieces, chopped nuts, you name it. Melt chocolate in microwave safe bowl - 30 second intervals - up to 2 minutes, stirring between each interval. Let sit a few minutes before beginning. Dip waffles in chocolate then let extra chocolate drizzle back into bowl. 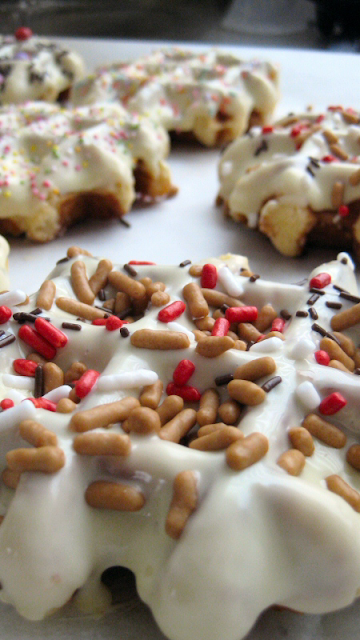 Place waffle dipped side up on prepared cookie sheet. Sprinkle with whatever you like. Let cool for a very long time - feels like a long time because you can't hardly wait to eat them... but you can do it! Enjoy with a nice cold glass of milk - or hot chocolate (depending on the weather and your mood, I suppose). Oh. My. Goodness. It's OK if I make these for breakfast, right? well, they are incredibly filling - so, you'd be eating like a king! and they say you should eat breakfast like a king - most important meal of the day right?! 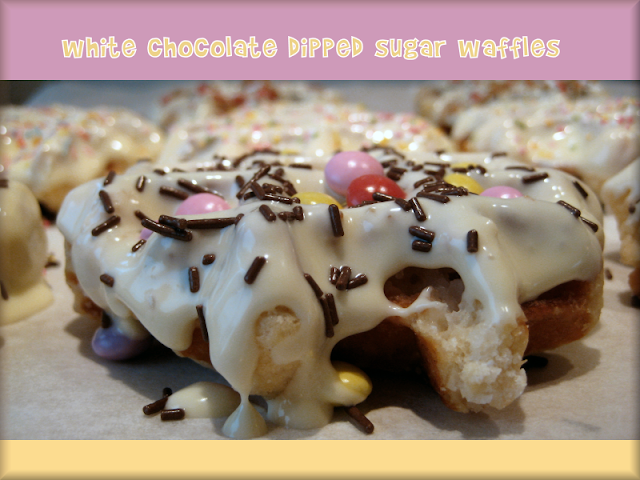 These look great... can't beat waffles dredged in white chocolate and sprinkles... yum! These are absolutely wonderful and delicious! I'm hosting the Culinary Smackdown Battle for March--the theme is Cookies. It's open to anyone, anywhere in the world. Would you like to join in for the fun? It doesn' have to be a new post on your blog. You can pick your favorite cookie from your previous post too. All you have to do is link up your cookie creation. I have some great prizes waiting. Hope to see your entry soon! @Amy, love to... just one entry mmm, which cookie will i submit?!!! Thank you for participating the Smackdown Battle. Best of luck to you. 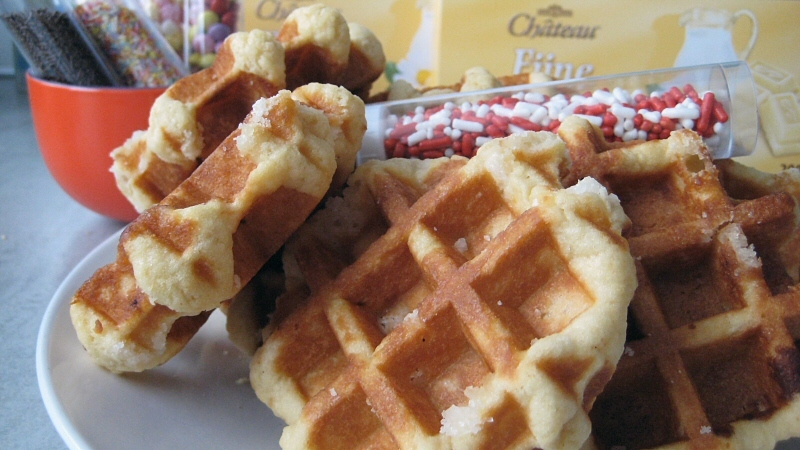 These white chocolate dipped sugar waffles sure looks fun and delicious. Wonderful choice to submit these cookies for the contest. Now that is true decadence. Love the pics. Thanks for linking this up to Sweets for a Saturday. These look really good Melissa! I just may try them. Also, thank you for stopping by my blog and leaving a comment today.